Last weekend I drove to Madison from Minneapolis for Teslacon. 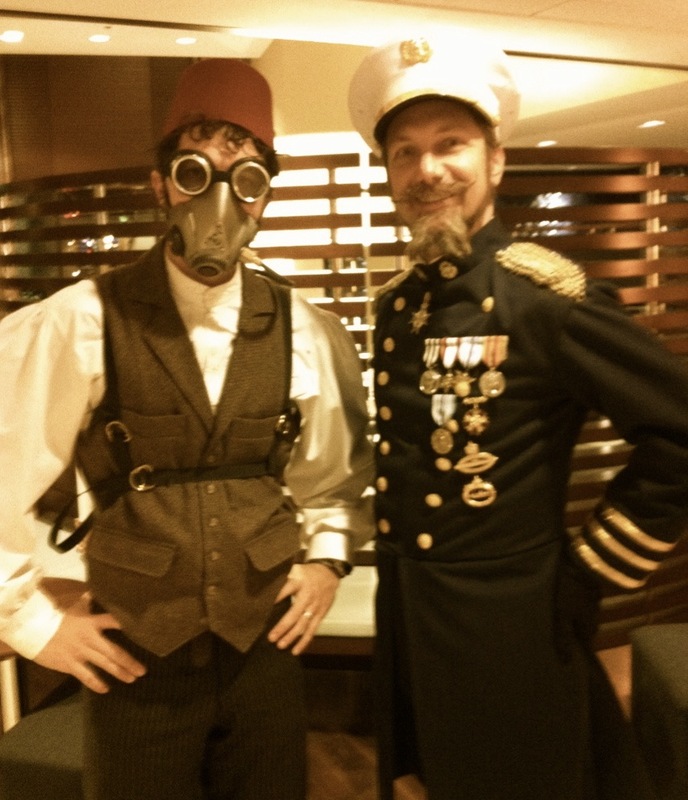 This is a relatively new steampunk convention in its second year but it has grown fast and formed a loyal following. This year there were some 750 participants, according to Lord Hastings Bobbins, the inventor and producer of the event. It is advertised as a total immersion experience, and the best way to evoke its feeling is to think of a Renaissance Festival in which everyone is in costume and mostly in character. Lord Bobbins has a crew of marvelous entertainers who play key roles. For example, the captain of the ship was played by an actor who channeled Gert Frobe in his portrayal of Captain Krieger of the H.M.S. Trident, a submarine capable of also flying above the waves. Though young and handsome with elaborately waxed moustaches, the captain had the voice of Gert Frobe as Baron Bomburst in Chitty Chitty Bang Bang. Announcements from the bridge came over speakers set up in the hallways of the hotel where the panels were presented. All done with a great sense of humor, for example when the captain announced that he was missing his strawberry ice cream. I had dinner with the Captain at the Captain’s table, set off in a special room and attended by the very efficient staff of the Sheraton (and perhaps also of the convention). 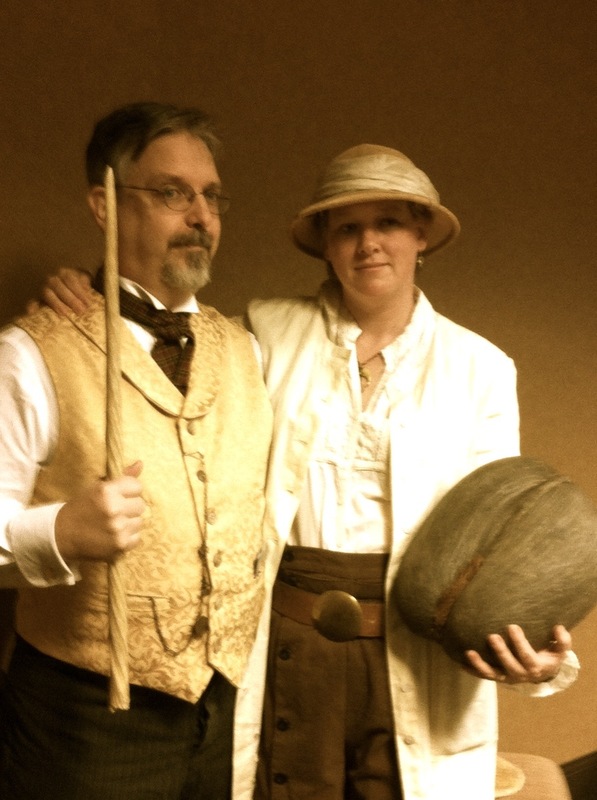 I enjoyed staying in my character most of the time, as Dr. Nautilus Cholmondeley, the inventor and airship builder. At the captain’s table not only did the guests stay in their characters, but they carried on a lively dinner conversation that ranged from discussing the (fictional) war going on between the English-German Alliance and an Eastern European alliance under the direction of the evil Dr. Proctocus and his Tick-tock men. He was rumored to not only be using robots as soldiers but also reanimating dead soldiers to fight again. The pros and cons of the morality of such an act was debated at the table among Lord and Lady Bobbins, Kapitan Krieger, and about 20 guests of varying natioalities. I had the pleasure of sitting across from a Russian Princess and next to a time-traveler and his wife. Now, if you enjoy developing a character and playing it ad lib, this is a wonderful chance to do so. If you love the steampunk aesthetic doubly good. 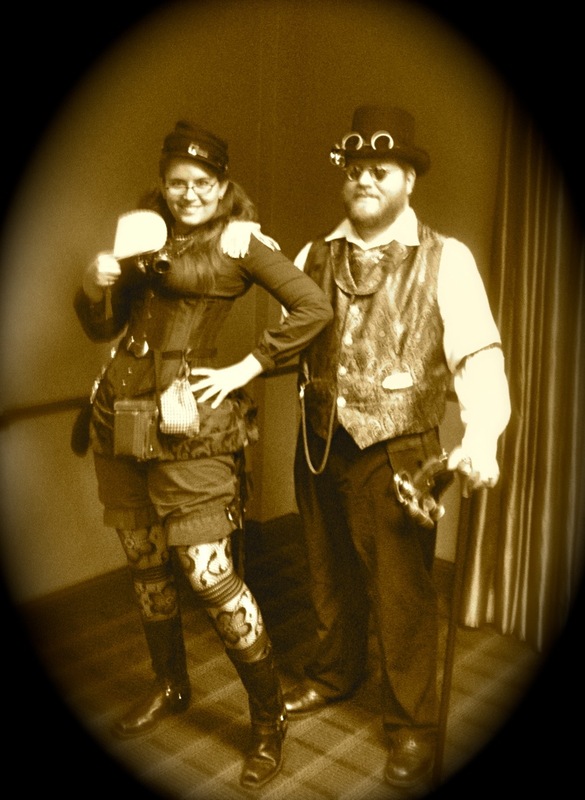 The lobby of the Sheraton Madision was awash in top hats and pith helmets, vast flowered ladies hats, and tiaras, and a host of wonderfully imaginative costumes combining the Victorian world with clockwork robotics and aether guns. There were many men and women dressed for war in some army, navy, or air corps. As theater, Teslacon is fascinating because the world and the history in which all these characters live and breathe is entirely made up by the committee of the whole. Lord Bobbins and his creative team make up a core story, but his lordship himself celebrates the fact that in steampunk it is the fans who create the story and the setting and the costumes. Steampunk is a fan movement of sorts that does not stem from any single author or any single book, movie, or television show. If one attends a Star Wars convention, one enters into a world that is largely shaped by the films in that series and the novels that were written from it. If one attends a Star Trek convention, same thing. Steampunk is in some ways a spin off from the Goth counterculture in as much as many Goths also enjoy steampunk’s darker side. And that is another aspect that makes it very different from ordinary Sci Fi conventions. The world is more consistent, and yet all over the place within its parameters. And a considerable number of people in the convention are what you might call professional conventioneers. I sat at dinner one night next to a group of young men (perhaps in their 30s) who were talking the business of conventions, but they were all dressed in top hats and the togs of Victorian gentlemen. They had dropped out of their characters in their conversation, but it is the sort of talk one might easily have heard in a group of young Victorian men. I overheard bits and pieces of conversation from the vendors and those who I presumed were performers, that told me these people made a living traveling about the country to steampunk conventions (and perhaps other kinds). Just as the vendors and performers at a Renaissance Festival travel around on the road to make their livings, so some number of the participants in Teslacon appear to do. There were, however, many people who had come as couples or in groups to attend the panels, parties, and to shop the vendor’s bazaar. I felt as if I was the only passenger traveling alone, which was a little lonely in the crowd, but at the same time allowed me to observe freely. There is a lot good to say about Teslacon. Too many things to put into a blog entry. So, let me just mention a few of my favorites. The opening ceremonies were actually quite exciting because here was I in a ballroom filled to the edges with top hats and corsets and goggles. All those people who share my passion for the genre. I felt like a newcomer, though, and really wanted to overcome my shyness to talk to people and not have to take my meals alone. If I failed to do that, it was my own fault for not asking. I am not adept at inserting myself into a group of freinds. The funny thing is too that when you approach a group of people attending a convention and you are in character, even thought they are also playing parts, they react to you as a stranger and a little suspect. Or perhaps that was my imagination. As an inveterate introvert, I was keenly aware that this was a convention in which the extroverts dominated. I was not, however, the only middle-aged steamer there. I met many others who were my age and older — mostly attending as couples. I had thought too that I might get to talk to the people attending my panel on Jules Verne. One of the reasons I proposed the panel was because I figured that way a few people would at least know my name. However, it didn’t work very well. The panel discussion went fine (except that my bit went on too long, as always happens); however, there were not many people there. About a dozen, I should say. Which isn’t bad but when you are in half a ballroom it seems thin. The rest of the weekend I spent listening to people tell me how much they wished they had not missed my panel. Perhaps I’ll reprise it next year. The mummy unwrapping was also great fun. Not a real mummy of course, but it looked pretty real, and Lord Bobbins was very entertaining as he raffled off the Egyptian artifacts he discovered in the bandages as he unwrapped Amentep Seti. It was very very well done and fun. The ship was supposed to be stopping in Egypt in its course from England west to China. The other sessions devoted to parts of the story written by the crew of the con were scheduled at times when I wanted to go to other talks, and this, I think, is a mistake. If the total immersion experience including a story is going to be offered, then it would be helpful not to schedule other events at the same time. One should not have to sacrifice an interesting panel on airship combat to attend those parts of the convention experience. But what I found was that the sessions that formed the core storyline of the voyage were not described as such in the schedule of events, and a day had passed before I realized what they were. I must mention the Tea Room also. Completely low-key, the tea room was a refuge with dozens of teas to select and many treats. Pay $10 one time and you can stop into the Tea Room as often as you like. Lovely! I only wish I had spent more time there! As always, there was room for improvement. I mentioned to Lord Bobbins that there should have been a larg map in the lobby plotting the ship’s course so we had a sense of where we were in the journey we were all pretending to be on. He agreed and told me that one was planned but time ran out. His creative team had their work cut out for them! In addition to a map, a plan or picture of the ship too would have been fun. There were many small posters in the hallways of the conference rooms to add to the setting, and HMS Trident emblems had even been put on the doors of our rooms in the hotel. More of this kind of decoration would be fun. Poster-sized posters, for example, instead of just 8.5 x 11 inch paper. It would also be nice in the future to have dinner seatings as in a real ship, and grouped tables so that no one had to dine alone. This would encourage mixing, especially if the purpose was explained to the attendees at the start. Of course, it was not possible for the convention to take over the whole restaurant — there were other guests (and weren’t they baffled!). I am sure that if I had asked one of the other parties of diners whether I could join them, I would have received a welcome, but my own reserved nature and the ordinary manners of hotel dining rooms inhibited my doing so. Accommodating single travelers is perhaps too much to ask, considering that there may have been no others besides me. However, I think even the newbies in couples or groups would benefit from some sort of cocktail or tea party at which it was expected they would mix and make friends. There were parties at night and I’ll admit that I did not go to any of them, except for the gala ball, and that for only half an hour. The bar in the ballroom did not have champagne, so I went in search of some. I know there were room parties but somehow did not get invited to them. However, there were a few that were generally advertised that I could — in theory — have attended except for the fact that I was so tired by ten p.m. This may be a silly idea, but it occurred to me because one of the panels on steampunk as a culture identified the “party animals” and the “bookworms” as two parts of the community. Could Lord Bobbins include a Library as a quiet room for us bookworms? I don’t know if this would facilitate introverts making new friends, but a quiet place to read besides one’s own room would be nice. I tried to read in the comfortable chairs of the hotel lobby, but always there were so many conversations going on around me and so much fabulous eye-candy, that it was difficult to read. Yet, I did not want to retreat to my private stateroom. On balance, these are very trivial suggestions, and I would mainly say to Lord Bobbins, carry one doing more of what you are doing! I look forward to next year (when I will be traveling with friends) and to the year after that, when Lord Bobbins says he wants to hold an “International Steampunk Exposition” drawing in groups from abroad. As for me, I am just happy that there is such a great convention in the midwest, because otherwise, I would have to travel to the east or west coast for conventions, entailing airplane tickets. Unless I get my zeppelin built…. By alferian in Uncategorized on November 22, 2011 . It was my wife and I first time at such an event and were also very excited to see everything. I like your ideas and would have loved a bit more get togethers for the newbies. Some of the extroverts are so outgoing, it was a bit intimidating to talk with them. I am normally great socially with groups, but when it comes to accents and the character, I clam up and get shy. We had a blast though and would like to go again next year. Great review! Did we actually meet? Remind me where it was. I think that some of the very outgoing souls were the professionals, but it was hard to tell the actors from the audience, so to speak. I think next year I will try to attend the “character development” session as I think it will help with becoming more comfortable “acting” the role. Hi Amanda, I remember you very well and we spoke several times. If I had been more energetic and not so reserved, I would have asked you to dance at the ball. You have the most darling smile. 😉 It was easiest to talk with the vendors, of course. They are all so interesting and most are very personable. Next year I hope to make a better effort, but I do need to keep a notebook and jot down people’s details. I realized that having a card is nice, but having one’s picture on it would be even more helpful for chaps like me who can’t put names to faces too well. The notebook would have allowed me to actually conduct sort of informal interviews too, which would have been nice to have for posterity. Remembering where everyone came from is also something. Were you from Milwaukee? Completely agree with your observations here. I had wished to attended the gadgetry session, but it was booked at 5pm across from the Fashion Show, which my partner would not dream of missing. Overall I was delighted by the things I saw and the individuals I got to meet and as a newb myself, it was a great time! The eyecandy and the plethora of costumes kept one’s head on a swivel and I am sure that my party and I missed a fair bit of the going-ons. I look forward to next year and the trip to the moon… and if you find yourself needing dinner company, by all means, stop by our table and say hello…. I will take you up on that! Thanks!